Text on this purple-shaded design reads Featherwise it's such a lovely day. This bird-themed design is inspired by the line "Weatherwise, it's such a lovely day" from the classic big-band song "Come Fly With Me." When you're having a great birding experience, chances are - Featherwise it's a lovely day, too! 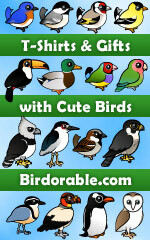 This is a cute design for any birder! To order by phone, call toll-free at 1-877-809-1659 from Monday - Saturday 9:00am - 9:00pm EST. You'll need to note the Product Number 030-1318469021 to make your order.